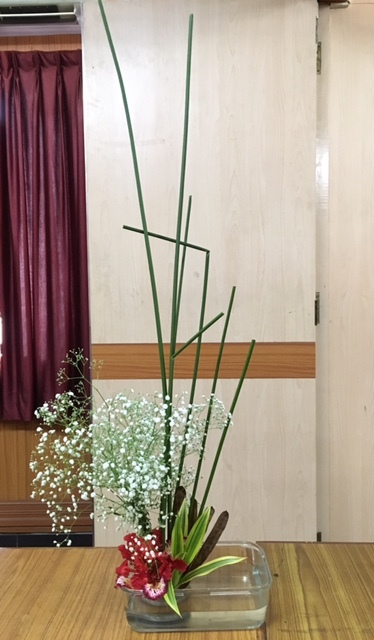 Sensei Molly, assisted by Chitra Rajan gave a demonstration of Sogetsu Ikebana, and here is the report by Chitra. A seminar on culture and society of Japan was arranged at The Raintree Hotel Anna Salai on 19 Mar 2016 by ABK-AOTS Dosokai, Tamilnadu Centre on behalf of the Japanese Consulate to facilitate social inclusion of differently enable people through cultural exchange . 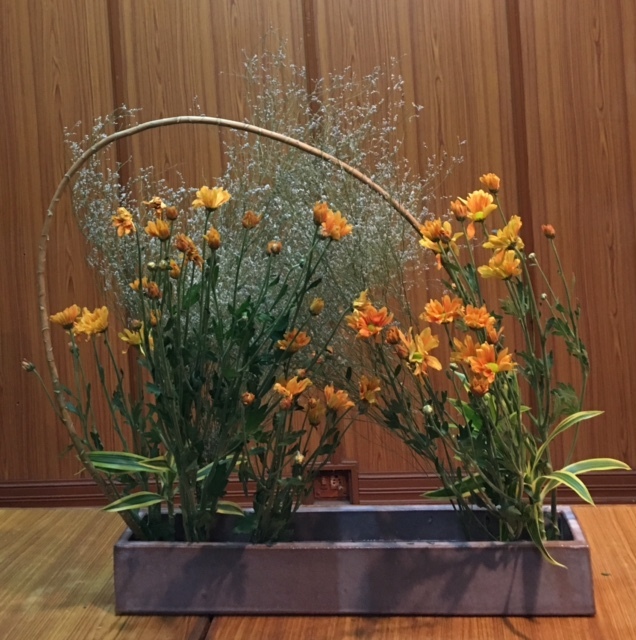 There were three exhibits of Sogestu Ikebana by Molly and one exhibit by Chitra Rajan as well. 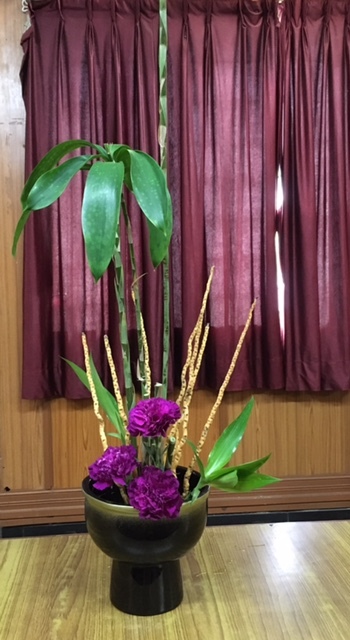 Chitra's arrangement- Twin bamboo containers with colocosia, dracena and various shades of pink chrysanthemum. All exhibits were well displayed and appreciated. Sensei Molly received a memento from the Consul General Mr Seiji Baba . 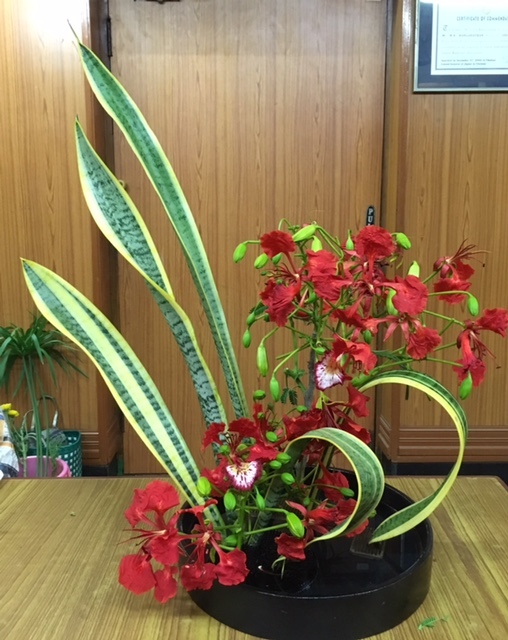 Mr Ranganathan the Executive Director of ABK conveyed his sincere thanks to Mrs Malathi Pandurang for accommodating his request to demonstrate Sogestu Ikebana in spite of her hectic schedule. Another highlight of seminar was the Origami exhibition and demonstration by a well known artist Mr Shivaram Ananthanarayan. New teachers are quick off the block! Our new Senseis Divya and Janaki were invited to conduct a workshop for kids. here is the write-up below. 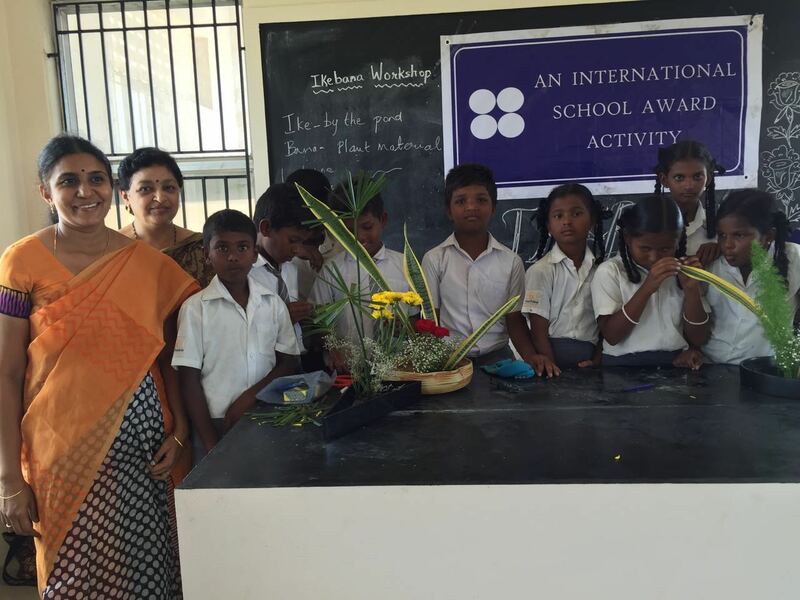 Gurukulam Trust Children School, Kovalam, Chennai invited us to conduct an Ikebana workshop for some of the students. Participants were boys and girls from classes 5 and 7. This was a part of the International School Awards project, a British Council initiative to promote, among other things, exposure for children to other countries and cultures, preparing them for a life in global society. 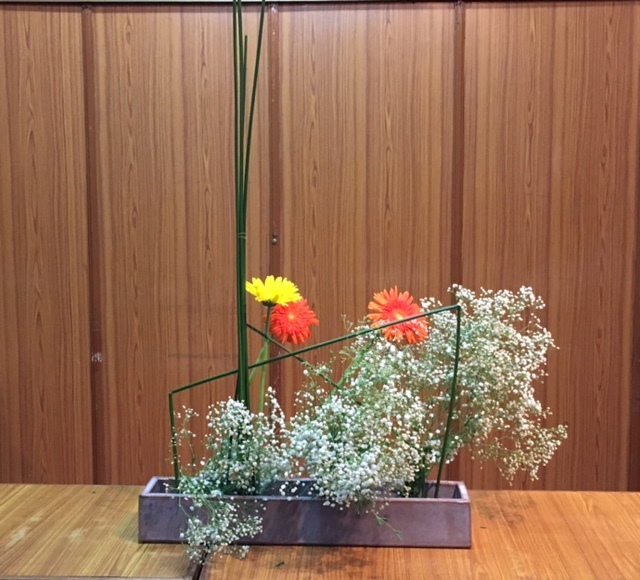 We facilitated the one hour session by briefly outlining the basics of Ikebana. 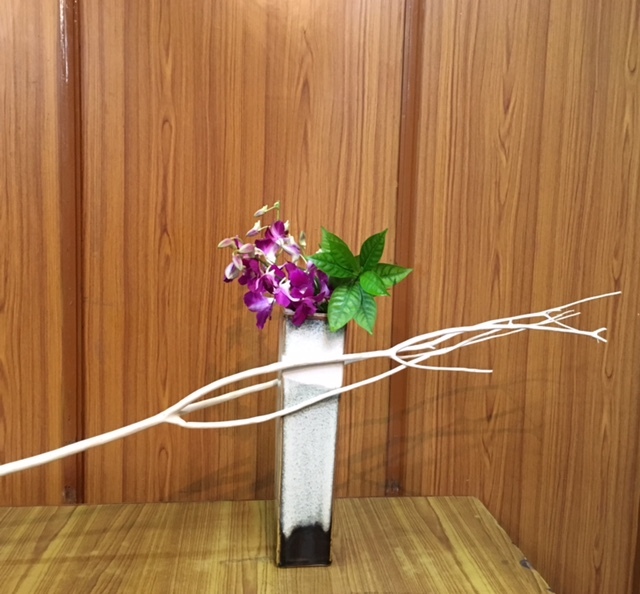 Divya made an arrangement in the basic upright style, using a black oval suiban and local materials like guava branches for main lines and temple tree flowers as jushis. She encouraged the children to experiment with different materials found in the neighborhood. Her idea to use clock hand positions to show the various angles of shin, soe and hikae was very innovative and children were excited to relate to this. Janaki demonstrated the basic slanting style using a suiban in shades of beige, with a curved surface. She used sansiveria for the main lines, gypsophilia and red carnations for jushis. After photo sessions, the focus shifted to a few children trying their hand at recreating the pieces. They were given additional material like umbrella plant, yellow chrysanthemums and monkey tail ferns. They were able to grasp the basics and were fascinated by the kenzan. They were told to the try alternatives like sand and coconut fibre to secure the plant material.A couple of boys used the stems and leaves to create their own miniature models. It was a very interesting experience working with enthusiastic youngsters. 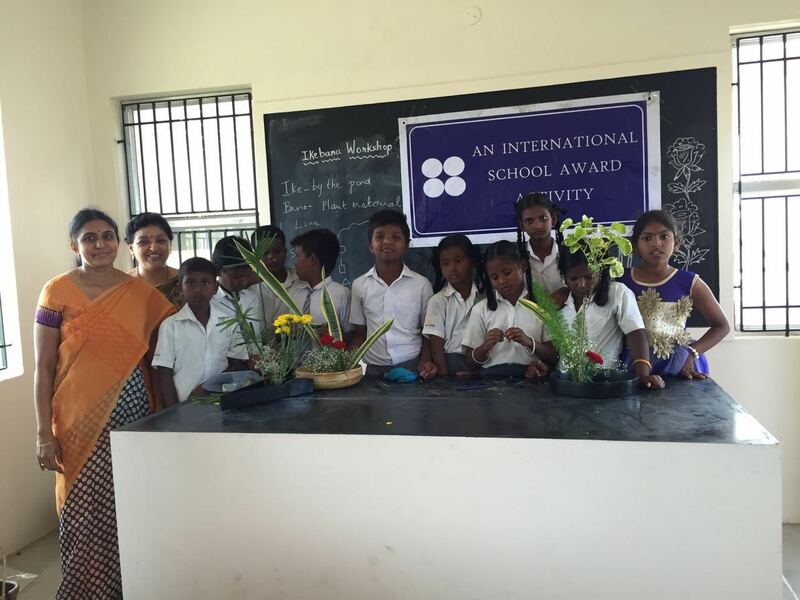 We thank Mrs. Malathi Pandurang for giving us this opportunity. The Basic Upright and Basic Slanting style were demonstrated to the children, with local greens. The Sogetsu Chennai Study Group reassembled after the summer break. At first, we had the business session. Malathi sensei handed over the Teachers Certificates to two of our new teachers - Janaki Rao and Divya Selvam. Congratulations to them, and wishing them a rewarding career in teaching! The annual reports were also read out - Chitra read out the annual report of the Programs Committee head, and Prerana read out the Finances report. We then moved on to the demonstration and workshop. It was a pleasure to welcome Venkatesh from Mumbai, our Study Group member. The demonstration by Malathi sensei was on the use of line and colour. Malathi sensei spoke about her recent visit to Bangalore, where from the eighth floor of her building, she was able to view the glorious sunrise and sunsets. The lines of the umbrella plant represented the tall skyscrapers seen in all directions, the Gypsophila were the clouds in her imagination and the colourful jerboas, the sun, as it rose in the sky, turning from red-orange to yellow. She skilfully worked her theme of line and colour into the composition, in this way. Continuing on her theme was the second composition with the line framing the eye's view. This line and colour theme - the dressing for the plans and coconut trees and the chrysanthemums for the evening sun, moving downwards. Sensei Prerana used her line to dramatic effect, in this minimalistic composition. Sensei Ambika, inspired by her recent trip to the Himalayas in Bhutan, worked her chrysanthemum lines into a distinctive structure above, reminiscent of the peaks, far above the clouds and rhododendrons. Sensei Divya - Vertical lines complimented by the deep colour of the carnations. 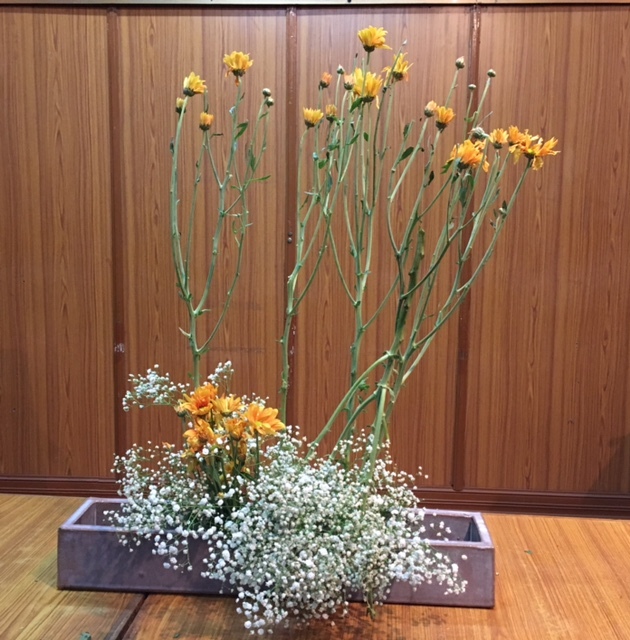 Chelvi used a wooden frame and the umbrella plant to provide two contrasting lines, with the chrysanthemums adding the colour. 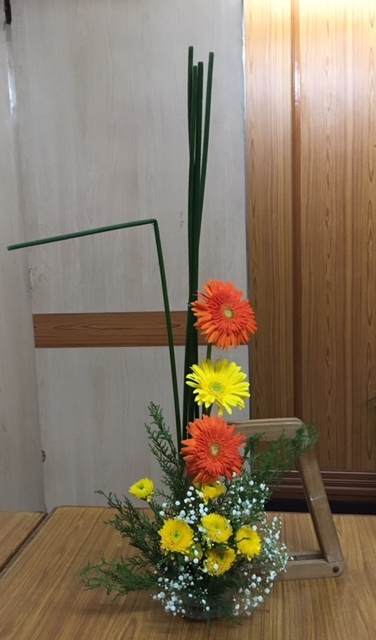 Chitra created a tight moribana composition with tall lines adding drama to the colourful composition below. 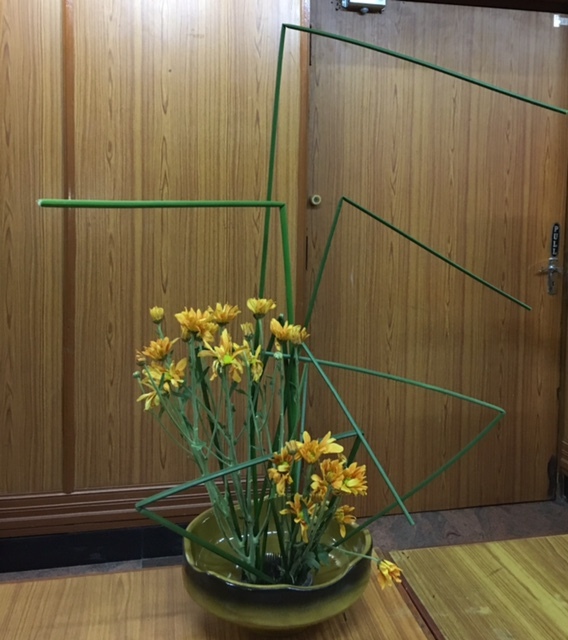 Venkatesh - Created a larger space with strong bold angles of the umbrella plant, and chrysanthemums completing the compositions, and adding colour. 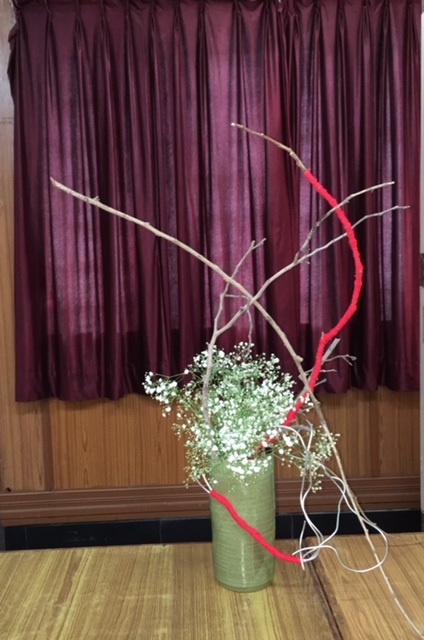 Sensei Meenu used wool-entwined twigs, to bring drama nd movement to her composition, with a Gypsophila mass as focus point.